Read Kauai! Literacy programs specializing in multisensory techniques. Speaking and listening are innate because we want to communicate. For some people, reading and writing are not easily developed. Read Kauai can help you - by using multisensory techniques to develop your child's literacy to its fullest! LITERACY : the ability to use language – to read, to write, to listen, and to speak. Reading and writing will enable one to function successfully at different levels in our modern society. 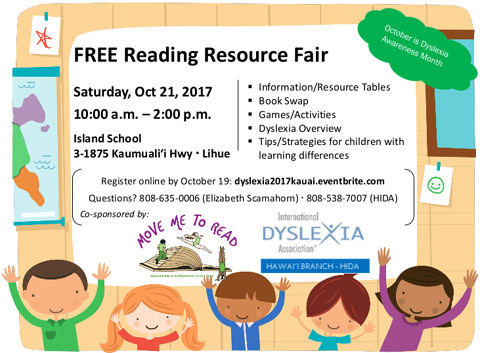 Jeanne Warburton Literacy Clinics and Hawaii International Dyslexia Association have joined together to present an interactive FREE Reading Resource Fair Saturday, Oct 21, 2017 10:00 am - 2:00 pm at Island School in Lihue. October is Dyslexia Awareness Month. One doesn't have to be dyslexic to benefit from understanding the learning process in reading and writing. Parents of students who struggle with the English language (because of dyslexia, language differences, second language, or missed critical components) are looking for supplemental programs, which support them to become the literacy advocates in the child's life – a powerful realization. 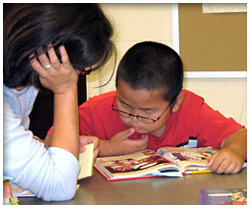 Throughout the year Read Kauai offers literacy clinics and language classes. Visitors to Kauai can have an Education Vacation. For more information please call Elizabeth Scamahorn at 808-635-0006 or Island School Office, 246-0233 x261 or email us . Customized literacy lessons are essential to meet each child’s individual needs. Learning is the invisible change that happens inside us when we make sense of what we experience or what we study. Learning can happen in any environment at any time. People of all ages feel excited, confident, curious, and alive when they are actively and creatively learning - constructing an understanding of the world and making connections between ideas and experiences. Learning is an essential need of all people and is the essential mission of most schools. Yet large numbers of students of all ages have difficulty learning in school, despite adequate intelligence, social adjustment, and exposure to schoolwork. Because learning is invisible, problems with it are not easy to recognize, understand, or address.